Stash away a pair of these comfortable yet cute shoes and avoid being barefoot on the dance floor at that 2016 wedding. We’ve all been guilty of being that girl at a wedding… the one who just can’t stand her heels any longer and has to take her shoes off. There are far worse things than being barefoot, but why risk having your toes trampled or stepping on a bit of broken glass? 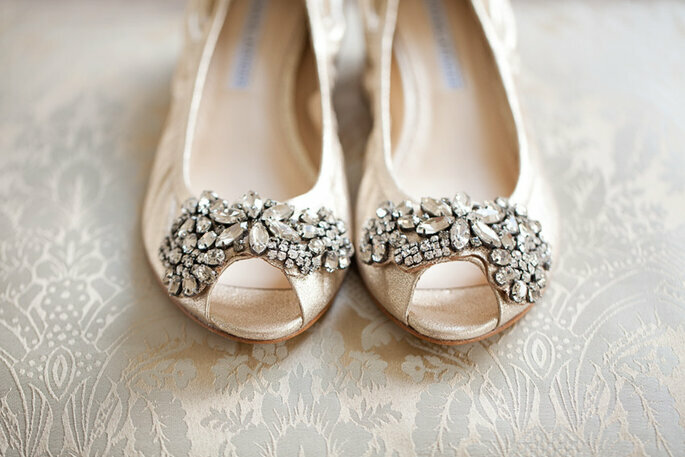 Take a fashion risk and wear a pair of adorable wedding worthy flats, or at least keep them as a backup in your bridal clutch! 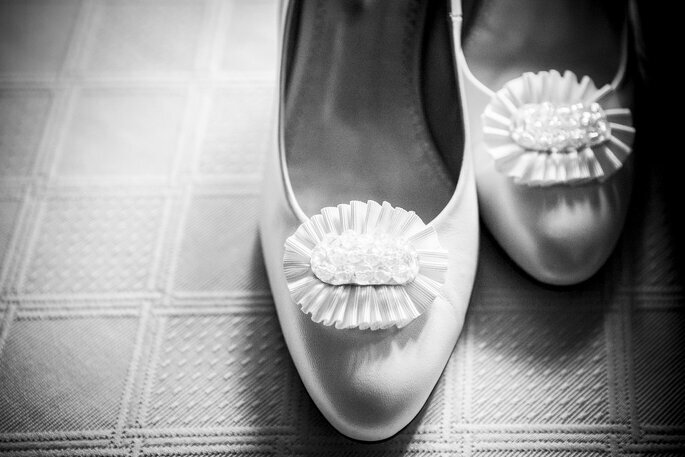 Flats don’t have to be frumpy or plain, we’ve got four tips for what to look for in a pair of fresh, fashionable flats for your big day! Whether you opt for a classic like gold or a brilliant pillar-box red, or if you decide you want to match your shoes to your wedding colours, an adorable dolly shoe in an eye-catching hue is a great way to add a cheerful accent to your bridal ensemble. A swatch of colour peaking out from under the hem of your gown is perfect for the bride who’s style is bubbly and playful. Maybe you already know that you want to be an ‘all in ivory’ vision on your wedding day. 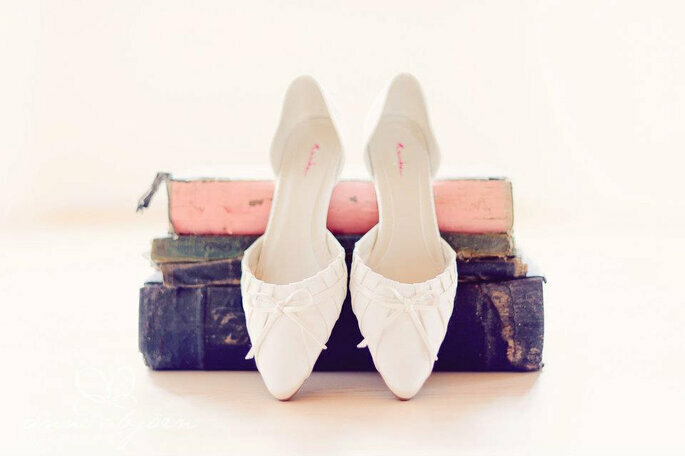 In that case look for ballet flats in luxurious fabrics like silk satin and fine suede. Certain textures, like dense sequins or flecks of glitter add bling and glitz, so that you’re still dressed up, even if your heel comes down. High quality metallic finishes also offer the right amount of pizzazz to prevent your look from becoming too casual. Lacey little slippers in ivory, cream, shell pink, silver and dusty gold are just perfect for the fairy princess bride with a woodland or rustic-chic wedding. Other shoes in sheer fabrics and decorated with tiny rhinestones, precious embroidery or fine ribbon bows create a lightness and instantly bring to mind the fashion icon that made the modern ballet flat famous: Audrey Hepburn. The cute rounded toe is one of the classic features of a typical ballet flat, but don’t be afraid to try something more on-trend. For example, pointed-toes are a timeless way to create an artier, more sophisticated look. Or perhaps you may find a fun, fresh way to incorporate some of 2016’s hot shoe trends such as geometric and angular shapes or laser cut-outs.